Sisters and brothers, on behalf of the Bolivian people, I greet the social movements of this continent present in this Act of Continental Solidarity with Bolivia. We have just suffered the violence of the oligarchy, whose most brutal expression was the massacre in Panda, a deed that teaches us that an attempt at power based on money and weapons in order to oppress the people is not sustainable. It is easily knocked down, if it is not based on a program and the consciousness of the people. We see that the re-founding of Bolivia affects the underhanded interests of a few families of large landholders, who reject as an aggression the measures enacted to favor the people such as a more balanced distribution of the resources of natural gas for our grandfathers and grandmothers, as well as the distribution of lands, the campaigns for health and literacy, and others. 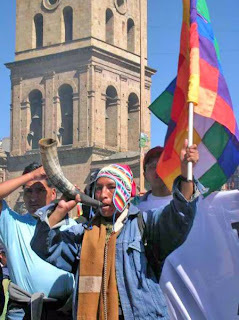 To protect their power and privileges and to evade the process of change, the ruling elite of large landholders of the so-called Half Moon (Media Luna) clothe themselves in the movements for departmental autonomies and the rupture of national unity, lending themselves to the yankee interests of ending the re-founding of Bolivia. However, in the revocation referendum of August 10, we just received the mandate of two thirds of the Bolivian people to consolidate this process of change, in order to continue advancing in the recovery of our natural resources, and to insure the well being of all Bolivians, to unite the distinct sectors of society of the countryside and the city, of the east and the west. Sisters and brothers, what happened with this revocation referendum in Bolivia is something that is not only important for Bolivians but for all Latin Americans. We dedicate it to the Latin American revolutionaries and those throughout the world, reaffirming the struggle for all processes of change. I was going to express the way to recover the life ways of our peoples, called Live Well (el Buen Vivir), to recover our vision of the Mother Earth, that for us is life, because it is not possible for the capitalist model to convert Mother Earth into a commodity. Once again we see the profound correlations between the indigenous movement and the organizations of the social movements, which also throw in their lot in order to Live Well. We greet them so that together we can seek a certain balance in the world. Along these lines, I want to share and propose for debate some 10 commandments to save the planet, for humanity and for life, not only at this level but also to debate among our communities, and our organizations. First, if we want to save the planet earth to save life and humanity, we are obliged to end the capitalist system. The grave effects of climate change, of the energy, food and financial crises, are not a product of human beings in general, but rather of the capitalist system at it is, inhuman, with its idea of unlimited industrial development. Second, to renounce war, because the people do not win in war, but only the imperial powers; the nations to not win, but rather the transnational corporations. Wars benefit a small group of families and not the people. The trillions of millions used for war should be directed to repair and cure Mother Earth wounded by climate change. Third proposal for debate: a world without imperialism nor colonialism, our relationships should be oriented to the principle of complementarity, and to take into account the profound asymmetries that exist family to family, country to country, and continent to continent. And the fourth point is oriented to the issue of water, which ought to be guaranteed as a human right to avoid its privatization into few hands, given that water is life. As the fifth point, I would like to say that we need to end the energy debacle. In 100 years we are using up fossil energies created during millions of years. As some presidents are setting aside lands for luxury automobiles and not for human beings, we need to implement policies to impede the use of agro-fuels and in this way to avoid the hunger and misery for our peoples. As a sixth point: in relationship to the Mother Earth. The capitalist system treats the Mother Earth as a raw material, but the earth cannot be understood as a commodity; who could privatize, rent or lease their own mother? I propose that we organize an international movement in defense of Mother Nature, in order to recover the health of Mother Earth and re-establish a harmonious and responsible life with her. A central theme as the seventh point for debate is that basic services, whether they be water, electricity, education, or health, need to be taken into account as human rights. As the eighth point, to consume what is needed, prioritize what we produce and consume locally, end consumerism, decadence and luxury. We need to prioritize local production for local consumption, stimulating self-reliance and the sovereignty of the communities within the limits that the health and remaining resources the planet permits. As the next to last point, to promote the diversity of cultures and economies. To live in unity respecting our differences, no only physical, but also economic, through economies managed by the communities and their associations. Sisters and brothers, as the tenth point, we propose to Live Well, not live better at the expense of another, a Live Well based on the lifestyle of our peoples, the riches of our communities, fertile lands, water and clean air. Socialism is talked about a lot, but we need to improve this socialism, improve the proposals for socialism in the XXI century, building a communitarian socialism, or simply a Live Well, in harmony with Mother Earth, respecting the shared life ways of the community. Finally, sisters and brothers, certainly you are following up on the problems that exist. I have reached the conclusion that there will always be problems, but I want to tell you that I am very content, not disappointed or worried because these groups who permanently enslaved our families during the colonial time, the time of the republic and this period of neo-liberalism, they continue as family groups, resisting us. It is our struggle to confront these groups who live in luxury and who do not wish to lose their luxury, or lose their lands. This is a historic struggle and this struggle lives on. Sisters and brothers, in the hope that the Continental Gathering of the III Social Forum of the Americas culminates with strong bonds of unity among you and a strong Action Plan in favor of the people of Bolivia and of our peoples, I repeat my fraternal greeting. That says it so well! As Daniel Ortega also said - what's going wrong with the world can be summed up in one word : capitalism.